Im not sure I am the only one experiencing this. So when I go geocaching, using the app on my phone, very often then sizes of the caches do not match the reality (or what is stated when I log in on my computer). Often XL is stated in the app, while the cache is actually a small. Yes there are some terminology differences between the web and the app. It's probably better to think of them as just four physical sizes rated 1-4. Online it's Micro, Small, Regular and Large. In the official app it's Extra Small, Small, Medium, Large. Third party apps? Who knows. Which app is telling you XL? Most likely that's the equivalent of the largest available size (Large). There's nothing that can be done about cache owners who don't list their containers with an appropriate size, but just keep in mind that within reason there could be some variation depend on what a CO considers a certain size. Sorry for the double post. I Discovered these threads and thought it was more appropriate to post it here - I tried deleting the other one, but didn't succeed. I have attached som photos so you can se it. The first is the app I have on my phone. The second is a cache stated as an XL in the app and the last photo is the same cache on the website stated as a micro. I already did find this cache and would say it is a small. So the app is definitely way wrong. Somebody typed "XL" when they meant to type "XS". Notice the green arc around XL isn't very long? That supposed to mean, visually, "less size", right? Aaaah.. Thanks a lot ! Why didn't I see that ? Well, is it "XL" in that language? Or should it actually still be XS there too? If so, it should be reported as a bug to be fixed. Yep - I think this is the issue. According to Google, small in English is lille in Danish. So, that's probably why the XS reads as XL. Although, does it make sense to continue using "X" for "extra" when the small portion of the size is being translated from English? I too would like to see a simple graphic, not the speedometer gauge, used for Size. It would also mitigate issues with translation. As others have mentioned about, both the app and website are showing the size chosen by the cache owner. 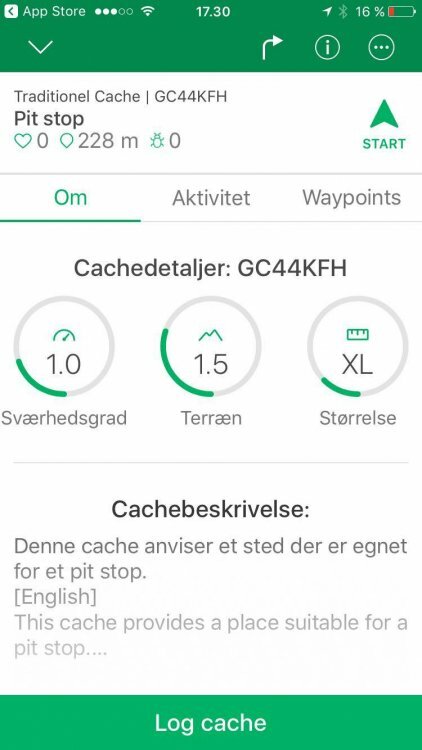 It is the cache owner that adds the size to the cache listing, so if you found a small container and the app shows it is extra small, then that is not the fault of the app. Thanks to noncentric for mentioning that this is a duplicate from another thread. 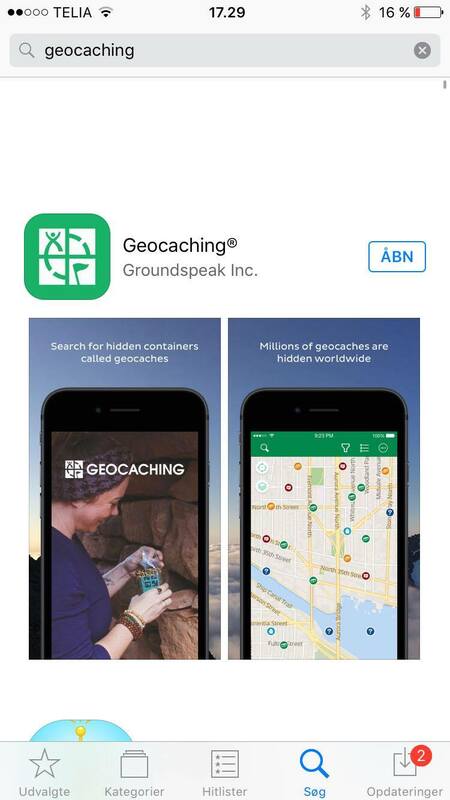 There's been a number of threads asking why Groundspeak still lists caches sizes on the site and the apps differently. There shouldn't be a technical reason why, so I just assumed that the person who created the apps didn't know any better. Don't understand how small is "often" changed to "XL" (which isn't a correct size anyway...), unless a CO is considering what the small might be housed in instead of it's actual size. - Or, with all the new changes lately, it's a bug. I'm pretty sure in this case it's the language localization that led to the "XL" as the "XS" label. It's not english. 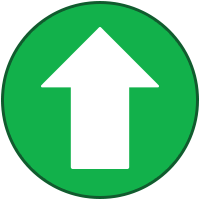 That's one of the reasons GS favours graphic icons over language/letters, to help reduce confusion. But, those graphics should be unified across the board, over all platforms. In this case, the graphic portion is correct, and the XL is explained by the language, so not a bug. IMO, this is a non-issue, with confusion cleared up. Are you sure there isn't an issue? There at least seems to be a translation issue which is leading to confusion for those who speak both English and another language. As far as I can tell, the translation of "extra small" to Danish would be "ekstra lille". There's no X in that, so using "XL" doesn't make any sense in Danish. For someone who doesn't understand this and also speaks English, the natural fallback would be to the English equivalent which would be "extra large", as evidenced by the OP. This is a great example of why text (especially abbreviations) are best to be avoided in applications where localization is required. The graphical boxes used on the website's cache listings are a great way of depicting the cache's size on a scale and leave no ambiguity regardless of language. Of course, this confusion could be largely avoided if the app just used the standard size labels, which when translated to Danish would probably be something like "Mikro", "Lille", "Fast", and "Stor". Even abbreviations of these could be ambiguous, so an unambiguous graphic and/or fully-spelled-out labels would need to be used. As far as I can tell, the translation of "extra small" to Danish would be "ekstra lille". There's no X in that, so using "XL" doesn't make any sense in Danish. For someone who doesn't understand this and also speaks English, the natural fallback would be to the English equivalent which would be "extra large", as evidenced by the OP. This is a great example of why text (especially abbreviations) are best to be avoided in applications where localization is required. Yep, thought that was understood with what I said, but I suppose I was focusing more on the "L" than the "X". So ignoring the X bit, there wouldn't be an issue in translation if the L is correct. But I think the question would be whether the Danish would understand "X" as representing "ekstra". If not, then yeah that is a translation issue (tho not being danish I can't speak for them :)). But if they would understand X as Ekstra (and L as Lille), then if the primary user base is Danish, it could be reasonable to assume that XL would be rightly understood, to the Danish, just confusing to the english. And as for graphics vs language, I completely agree, per my last comment. And graphics and terminology should be universalized across platforms within respective language locales. So yeah, "XL" as a whole can lead to confusion, if only because "XL" also represents something very different in English (whether X and L are valid in Danish or not), especially for people who speak both languages fluently. The only ways to address it that I can see are a] a unified graphic icon for size on each platform (which we had, but GS doesn't seem to want to use on mobile any more), or b] text localization that has a very distinct and clear short form for sizes, which are also hard to confuse across languages. Then again we could just be making another mountain out of a molehill. Confusion about this may be so miniscule, and this instance was resolved very quickly, so it may really be a non-issue not worth the resources to deal with But that's up to Groundspeak. I agree. Looked to see if I could find the website thread on this (I thought you created it), but can't spot it. I can't recall whether there was ever a thread specifically covering the non-standard size labels. It was just one of those things that kept being mentioned in threads discussing the app. Micros are not called micros, they are called XS or extra smalls. Similarly, regular are not regular, they are medium. Sure, the terms make sense, but that may lead to confusion during geocaching 101 seminars where we talk about micros, regulars, etc. How it could go for this long without being fixed is beyond me. Is the app team still holding out hope that the web team will be the ones to change and adopt the new labels? After this much time, I think it's time to throw in the towel and just revert to the longstanding, de facto standard labels. Still can't find it, but mine was the second post in that website (ways to improve) thread, the reason I remembered it. A bit OT, but a bunch of questions about the apps lately seem to show that the word "premium" for advanced caches is mistaken a lot again too. - Haven't loaded an app (still undecided which OS this time, and using a Rugby flip...) so can't see for myself if wording is getting confusing again for new folks as well. XL for 'extra lille' could in principle be correct, but we would never use this terminology in Denmark. When it comes to sizes we use the english terminology. So for me it was very confusing (as you can see). I agree that the graphic is not very useful. At least I weren't able to figure it out by my self. If the graphic was more explanatory it might be that big of a problem with the translation. Yes the benefit of the prior graphic was that it was absolute (4 sizes), but not precise (the actual measurements) which left it regionally relative rather than strict rules, which is better for CO judgement. The dial/ruler design has many, many meanings, uses and implications, both symbolically and in the real world, and for size could imply any number of sizes from 'empty' to 'full' or 'min' to 'max', which itself is confusing. But more jarring is the difference between web and mobile. They really should be unified. I agree with this, although I worry that unifying the two platforms would result in the web adopting the app terminology, which I would consider to be a step backwards. I worry that unifying the two platforms would result in the web adopting the app terminology, which I would consider to be a step backwards. Insofar as the design stands at this moment, I agree.